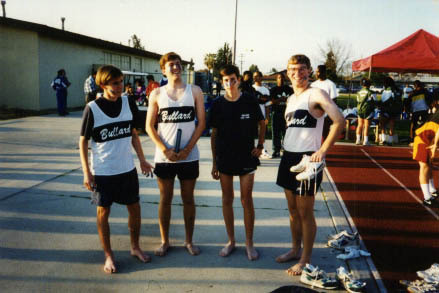 During the 1995 Track Season, the MAD FIGS all attended the Sanger Metric Classic Track Meet. As usual, they were entered in distance running events. But the Bullard Coach, Ms. Stewart, decided that the team did not have enough people doing the distance relay event (4 X 800 meters), and entered Scott Dogg, the Animal, Paul, and Justin as the "B" Team. Unfortunately, all the competitors from the other schools were Varsity level runners, while the MAD FIGS relay team didn't stand much of a chance. Since it was obvious that they were about to make fools out of themselves, the MAD FIGS decided to take things a step further. Armed with blue tempera paint, they attempted to recreate the styles used by William Wallace and his friends in Braveheart. They also planned to run barefoot, but meet officials questioned Scott Dogg (the first leg of the relay) on the starting line, and he was forced to wear shoes after all. Scott Dogg managed to keep within about 20 seconds of the leaders in the first leg (a fairly huge gap), and things went quickly downhill from there. The MAD FIGS lost about 10 seconds on every lap, so by the time Paul got the baton for the final leg, they had already been lapped by the race leaders. By the time the 2nd to last place finisher came in, Paul still had over 200 meters to go. All eyes were on the man with the painted face as he finished the final stretch. Careful observers could see him hold the baton out with his right hand and do the pen trick - once, twice - and then triumphantly yell out "FREEDOM!!" as he crossed the finish line. Then, the red flag went up. The MAD FIGS relay team was disqualified for unnecessary celebration - for finishing over a minute behind everyone else. The BHS coaches were not happy, but the MAD FIGS recognize the race as a truly historic event.